Finding a lump on your body can be one of the most terrifying moments for anyone, but is surprisingly one of the most trying issues for primary care doctors as well. Why? These superficial lumps and bumps cannot be diagnosed by physical exam or imaging studies alone. Thyroid nodules, or lumps on the thyroid gland, are common and often go unnoticed. For example, a thyroid nodule can be discovered by your doctor during a regular yearly physical, or it may be found accidentally because you had an imaging test for an entirely different medical issue. In fact, thyroid nodules are so common that they are found in up to 60% of U.S. and European populations. An annual incidence rate of 0.1% in the U.S. suggests that 300,000 new thyroid nodules are detected in the U.S. each year, and studies have shown that thyroid cancer is now the fastest growing cancer among women. 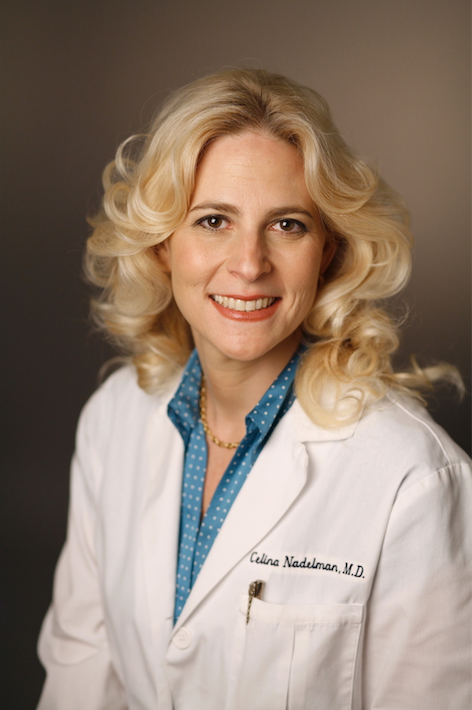 Dr. Celina Nadelman, an M.D. 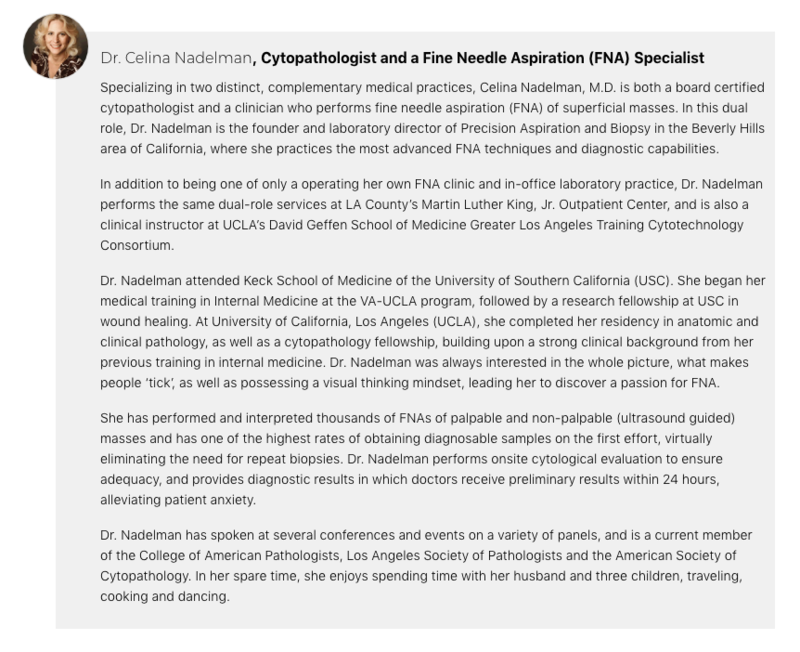 who uniquely serves as both a board certified cytopathologist and a fine needle aspiration (FNA) specialist in Beverly Hills, California. How can you tell which lumps have cancer? A tissue sample is needed to determine what the lump is, either by cutting it out entirely through surgery or via a small needle biopsy called FNA(fine needle aspiration). More than 90% of thyroid nodule lumps are actually benign, so you wouldn’t want to put yourself through the dangers and cost of unnecessary surgery. On the other hand, you don’t want to be living with a cancer that could’ve been treated. The best way to tackle this is by having a biopsy that is less risky, easy, fast, accurate (in the right doctor’s hands) and cost-effective. That’s where an FNA specialist comes in. They perform a quick, relatively painless and cost-effective biopsies for lumps found all over the body, including salivary glands, breasts, lymph nodes, tongue, soft palate, eyelid, head and neck, back, arms and legs. When FNA specialists also act as pathologists, the specialist is not only performing the biopsy, but they are also the doctor who looks at your tissue under a microscope to make the diagnosis. These doctors can even look under the microscope during a procedure to make sure there is enough tissue to make an accurate diagnosis. This step eliminates the burden of having patients return for an additional biopsy. Additionally, this kind of quick analysis helps doctors determine if other types of tests are needed for the patient. In some cases, if a patient has a thyroid nodule examined, it may require an additional assessment like a thyroid molecular test called Afirma. When an FNA specialist is only capable of doing a biopsy procedure, the sample slides musts be sent to a pathologist in a laboratory for analysis. In this situation, it takes longer to get your results, and often times the pathologist does not receive enough tissue to assess. When FNA physicians are alsopathologists, they have the ability to give you a preliminary diagnosis immediately following the biopsy, or provide results to your doctor within 24 hours. Therefore, as a seamless experience, and a sort of one-stop shop, an FNA specialist who is also a pathologist will see the patient, retrieve a sample, and make the final diagnosis all in one office visit. This can simplify and speed up the entire diagnosis process, offering you a quicker turnaround that can lower your anxiety and help you get the treatment you need faster. Your internist or general practitioner should thoroughly examine your thyroid gland during each annual office visit. If your doctor finds nodules during a physical examination, consider your options for next steps. You may not need to go through what may seem like obvious steps of imaging scans, referral to an endocrinologist, then an FNA procedure, and then wait for results – which could take months. A direct trip to an FNA specialist could be the most optimal choice. Patients should keep these factors in mind when evaluating biopsy options with their doctor. Not only are convenience, accuracy and efficiency important when determining where a patient will go, they should also look for a comfortable and professional atmosphere. Look for doctors willing to take special care of patients and keep them calm during this typically stressful time in their life. It is important to feel comfortable in every step of this process.